Today, Jaguar revealed its I-PACE Concept vehicle, an all-electric performance SUV(¹). The concept previews the first-ever electric vehicle from Jaguar and features a targeted range of 220 miles on the EPA test cycle. “The I-PACE Concept is a radical departure for electric vehicles. It represents the next generation of battery electric vehicle design. It’s a dramatic, future-facing design – the product of Jaguar DNA matched with beautiful, premium details and British craftsmanship. The Jaguar I-PACE Will Be On Sale in the United State in 2018. The Jaguar I-PACE Concept is one of the most visually arresting concepts ever produced by Jaguar. Taking full advantage of the packaging freedom offered by electrification, the design and engineering teams took the opportunity to rethink the vehicle’s overall proportions. The result is an exceptional vehicle that combines an advanced cab-forward design inspired by the Jaguar C-X75 supercar – incorporating the smooth silhouette of a coupe, in a five-seat SUV. 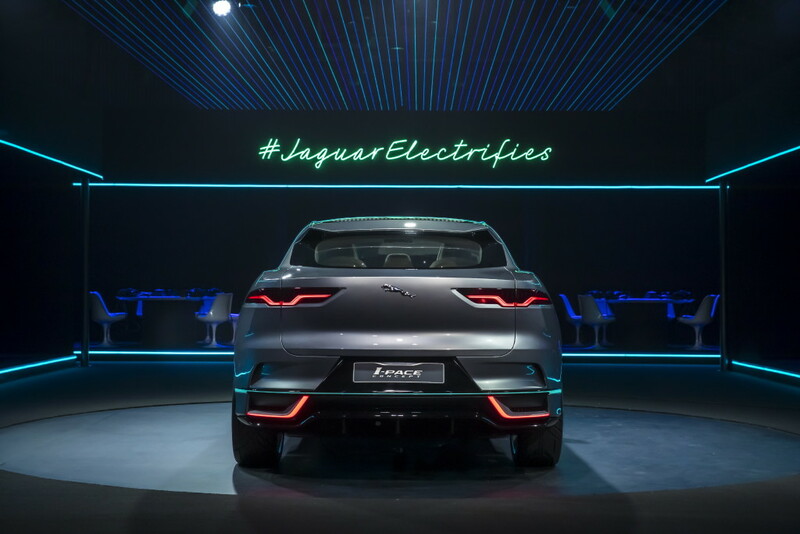 The I‑PACE Concept embodies the technological advances under its skin – and the Jaguar design team’s belief that consumers are ready for bolder electric vehicle designs. “The opportunities offered by an electric powertrain are huge. Electric vehicles offer designers much greater freedom, and it is an opportunity we must grasp. This is why the I-PACE Concept is developed on a new architecture which has been designed to optimize electric vehicle performance, aerodynamics and interior space. With the I-PACE Concept, the revolution is in the profile, not the design language. The profile is possible because this car is electric. It’s not just that we wanted to create something that was very different from anything else we do: we wanted the design to celebrate the new battery electric technology. The electric drive system afforded the design team additional freedom to achieve the dynamic proportions on the I-PACE Concept. 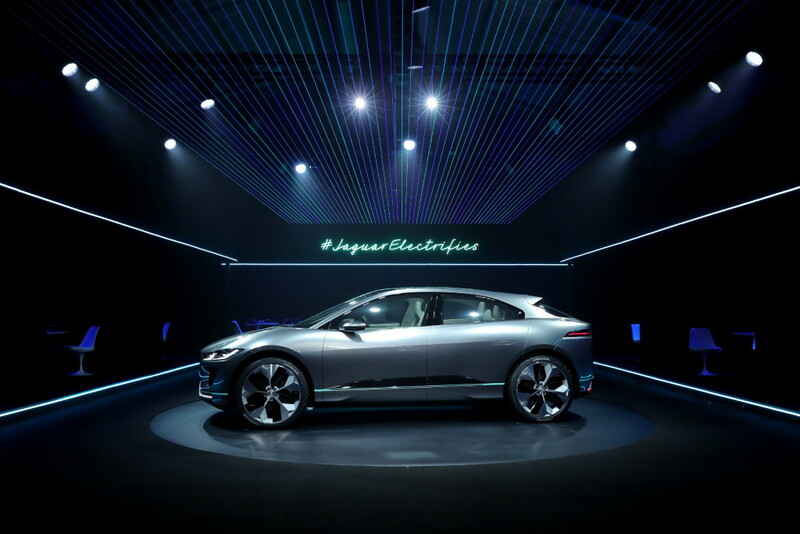 Leveraging the technological possibilities of electric driving, the I-PACE Concept introduces big design changes and finds fresh expression for the premium, personal touches and British craftsmanship Jaguar is known for. Without an internal combustion engine and transmission tunnel to package, the design of the I-PACE Concept brings the cabin forward, extends the wheelbase and shortens the overhangs. This enables the silhouette to become more aerodynamic and the haunches to develop more powerful proportions. It also enlarges the interior space and improves vehicle dynamics and visibility. As a result, the profile of the I-PACE Concept has more in common with the C-X75 mid-engine supercar than conventional SUVs. The evidence is clear in the cab-forward proportions, the dynamic heart line, curve of the front fenders, powerful proportions of the rear haunches and the large, purposeful wheels. Despite this, the overall footprint of the I-PACE Concept is as compact as a conventional mid-sized SUV. The long, 117.72 inch (2,990mm) wheelbase creates a voluminous interior with a level of rear knee room usually only found in full-size SUVs and luxury sedans. With its streamlined profile, sweeping lines, large wheels and muscular rear haunches, the I-PACE Concept represents a new generation of electric vehicle. Bringing together hallmarks of the Jaguar brand, but featuring new lines made possible by the electric powertrain; the design of the I-PACE Concept features a dynamic aesthetic that expresses its performance, innovation and style. The long wheelbase as well as short front and rear overhangs help to deliver a coupe-like roofline. The cabin sits low between sets of sweeping fenders, creating a sense of movement; giving the body a fast, tapering waistline. The dynamic window lines further enhance the sports car-inspired looks. The cab-forward design is accentuated by the windshield’s steep angle and heavily curved glass, flowing down into a low hood that adds to the sense of supercar style. The muscular wheel arches are sculpted around breathtaking 23-inch Nighthawk wheels finished in Technical Grey with Gloss Black inserts and feature a beautiful diamond-turned pattern, both of which underscore a sense of purpose for the I-PACE Concept. The dynamic intent of the wheels is further enhanced by bespoke 265/35/R23 tires that feature a unique tread pattern. The powerful rear haunches add to the muscular stance, further enhancing its sports car-like poise. Close work between the Design and Aerodynamics teams not only achieved a drag coefficient of just 0.29 Cd, it also inspired a technological edge to the concept’s styling. Flush door handles help to reduce drag by only sliding out when activated. Aerodynamically optimized side skirts also blend form and function by channeling air more efficiently around the wheels. The design of the I-PACE Concept communicates muscular performance. The low hood and wide curving wheel arches combine to marry sports car aesthetics and SUV presence. A broad, distinctive grille with a hexagonal grid in gloss black retains a key element of Jaguar design DNA while also providing aerodynamic and cooling benefits. Airflow also passes through the C-X75-derived hood scoop, helping to reduce drag. Slimline full LED headlights incorporate a signature Double-J daytime running light motif and help to further emphasize the vehicle’s clean lines. The sharp styling of the rear of the I-PACE Concept provides a clear indication of the vehicle’s dynamic potential and efficiency. A slender composite spoiler reduces lift at higher speeds without generating drag and has the secondary benefit of enhancing the vehicle’s sporting character. The steeply sloped rear window aids the vehicle’s aerodynamics and incorporates an advanced hydrophobic coating on the glass, eliminating the visual clutter of a rear wiper. The shape and design of the rear window glass are in direct contrast with the squared-off design of the rear lower valance and extended rear three-quarter fenders; projecting power, but also benefitting from improved aerodynamics which enhance overall efficiency. Relentless design optimization ensures that form and function work together beautifully. The bold styling accentuated by the vehicle’s short rear overhang and prominent wheels, also encourages air to cling longer to the vehicle, stabilizing airflow at speed. Ingenious rear vents serve the dual purpose of providing a clever visual replacement for tailpipes, and channeling turbulent air from the rear wheel arches into the vehicle’s wake, making the car more aerodynamically efficient. A rear diffuser also contributes to aerodynamic efficiency while simultaneously enhancing the low-slung stance of the I-PACE Concept. 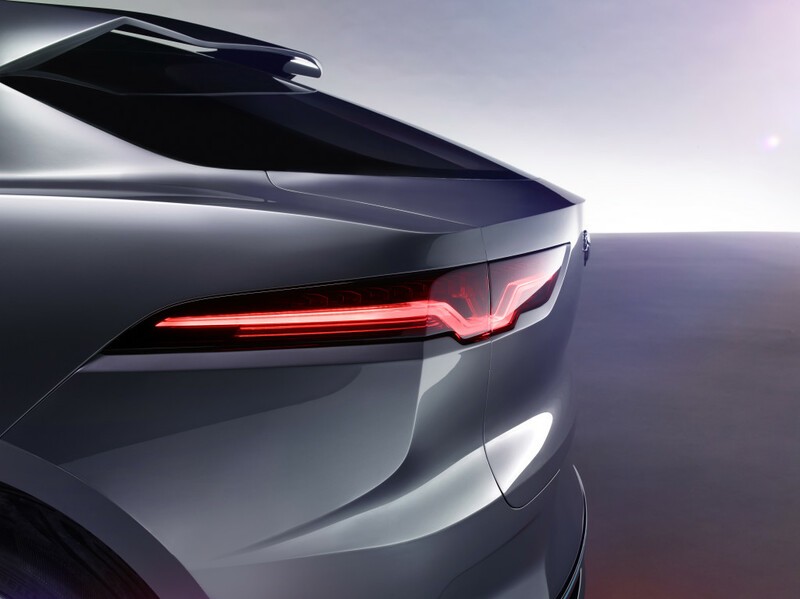 The LED tail lamps, while similar to those on other Jaguar models, square off the roundel graphic for an edgier and more technical look. The LED tail lamps, while similar to those on other Jaguar models, square off the roundel graphic for an edgier and more technical look. A broad, high-mounted LED stop lamp is integrated invisibly beneath the spoiler, visible only when the driver brakes. Jaguar cockpits have always been driver focused; the I-PACE Concept is no different. Inside, the cockpit is complemented by intuitive interface designs and advanced materials that reflect Jaguar craftsmanship in new and innovative ways. The five-seat I-PACE Concept is a clear statement of plans for a production Jaguar model with future-focused design, pervading the open, spacious interior. 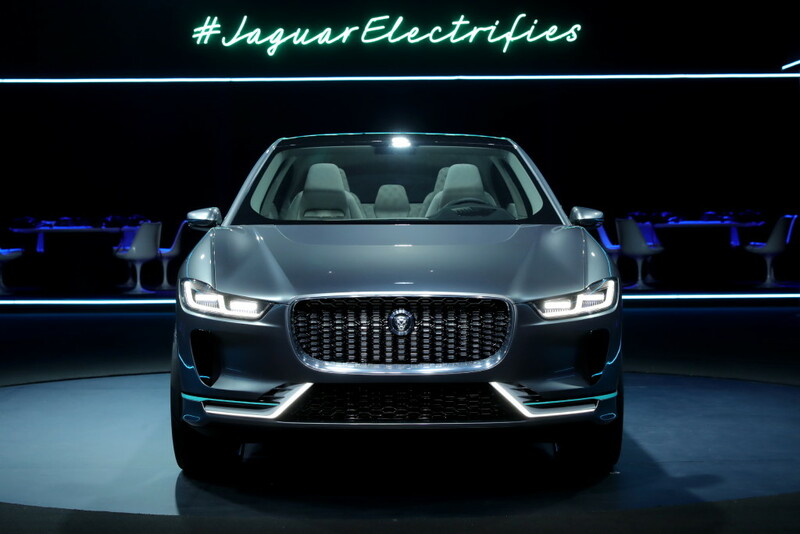 It also showcases a blend of new technologies and traditional materials that characterize a vision for what a Jaguar electric luxury vehicle could be. 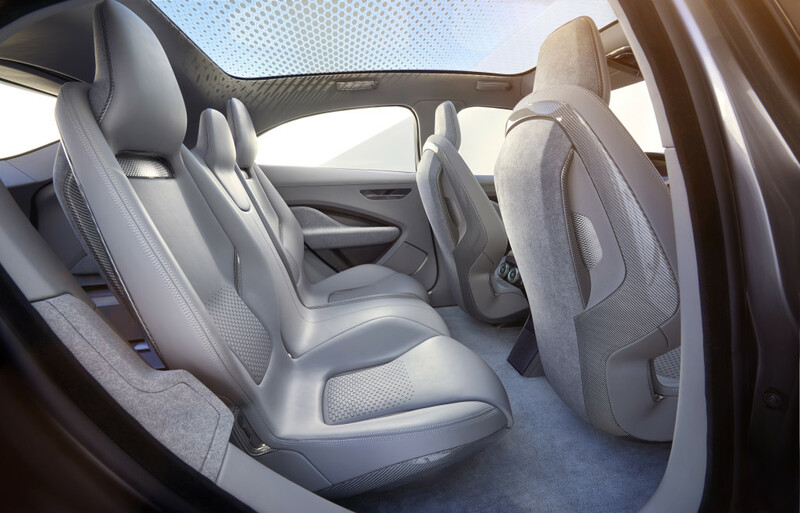 The I-PACE Concept is a perfect example of just how much interior space the Jaguar cab-forward design and electric powertrain creates. “Our brief was to create a spacious performance SUV that could comfortably carry five people. Otherwise we had a clean sheet of paper. To deliver this, we embraced the freedom that electrification offers designers. The driver and passengers sit lower in the I-PACE Concept than in conventional SUVs, while slimline seats position the hips lower in relation to the heels; this ‘Sports Command’ driving position helps to enhance a sense of connection with the road. The cab-forward design of the I-PACE Concept, low hood and short overhangs provide the driver with exceptional visibility, view of the road and the vehicle’s surroundings. A little like the Jaguar E-Type, the front fenders beautifully frame the road ahead, enabling drivers to use them to sight a line through corners with confidence. From the moment the door opens, the feeling of interior spaciousness is clear. 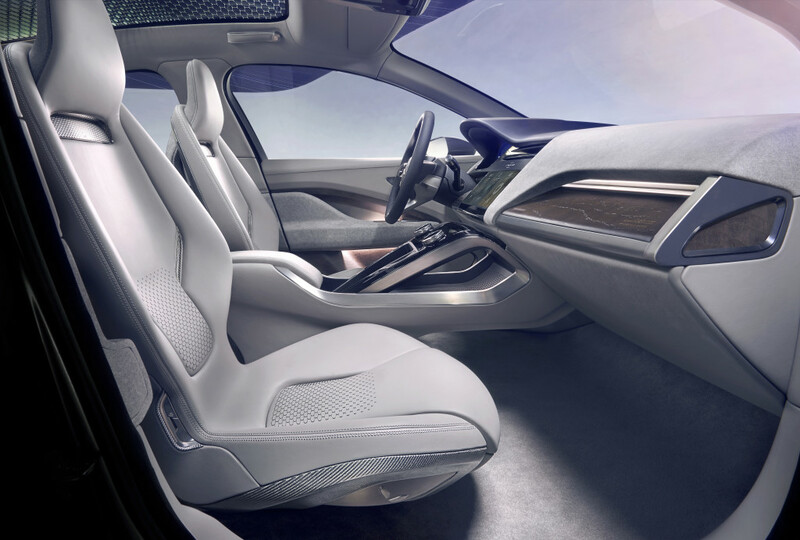 Entering the I-PACE Concept, the driver can view the entire width of the flat floor through a cantilevered center console, helping to deliver an immediate sense of the space and openness inside. The instrument panel is positioned low and its simple horizontal lines and minimalist switchgear help further emphasize the interior’s size. The center console cossets the driver, with two ‘looping’ metal struts beautifully framing the access to a storage area under the control panel – a motif that will recur in other future Jaguar vehicles. These struts also enable a tactile replacement to the traditional gear shifter. Buttons integrated into the strut allow the driver to reach down and select forward, neutral, park or reverse intuitively with a simple press of the thumb. 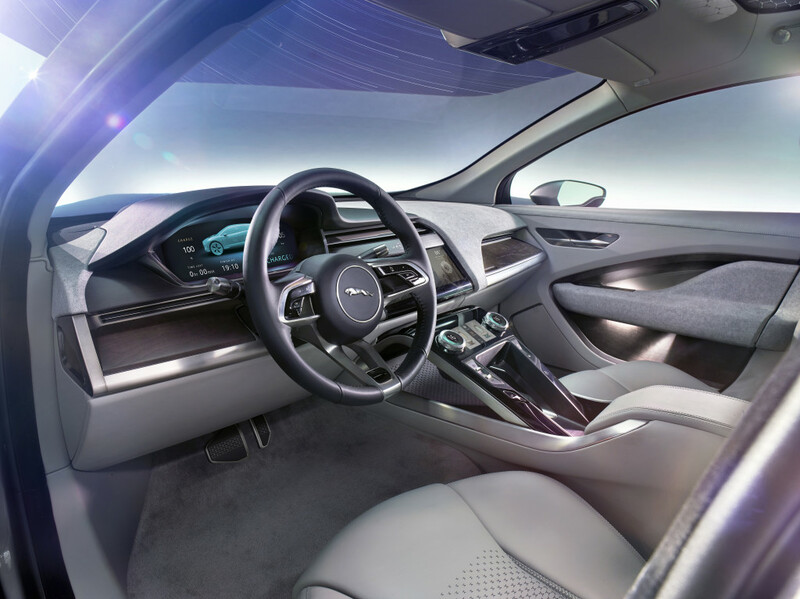 Throughout the interior of the I-PACE Concept, Jaguar carefully selected high quality, natural materials delivering high standards of craftsmanship and a pervasive sense of both luxury and sustainability. The interior’s finishes create rich textural contrasts. Windsor leather covers the front of the seats, laser-cut with the signature Jaguar lozenge motif, sewn with contrasting twin-needle stitching and edged with colored carbon fiber trim. The seat backs are finished in Moonstone Alcantara. The doors feature a similarly tonal layering of aluminum, Alcantara and dark, unvarnished open pore walnut veneers. Fine details such as the audio speaker grilles are integrated into the door handle finishers and feature a jewel-like, 3D design that also references the Jaguar lozenge motif. 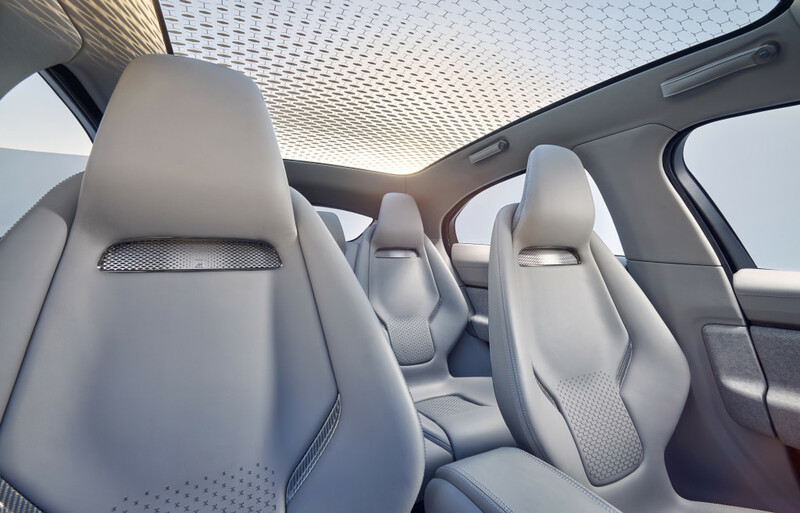 A full-length panoramic glass roof extends the sweeping angle of the windshield and floods the interior of the I-PACE Concept with natural light. The glass integrates seamlessly into the interior thanks to a lozenge-patterned ceramic print that unites the roof with other interior surface finishes. At night, an array of LEDs embedded in the roof illuminate the patterned glass to create a stunning visual effect. Laser-etched detailing on the instrument panel’s burl wood surface reads: “Lovingly crafted by Jaguar. Est. Coventry 1935”. The beautifully-crafted GPS coordinates locate the Jaguar design studio – birthplace of the I-PACE Concept. The signature Jaguar lozenge pattern has been applied onto the seat cushions using an innovative laser-cutting process. The same effect can be found on the pedals and the center console surround. Labels with Jaguar paw prints are stitched into the seams of the seats for a playful accent and symbolize the warmth and wit unique to the Jaguar brand. The signature Jaguar lozenge pattern is photo-etched onto the Meridian™ audio system speaker grilles integrated into the doors. The brief for the Jaguar I-PACE Concept was to create a performance SUV that is spacious, sporty and useable. The cab-forward layout creates unprecedented interior space that is far larger than is possible in vehicles powered by internal combustion. With no engine bay and a battery pack that sits flat between the axles, the cab-forward design’s long wheelbase and short overhangs enable a footprint of 184.25 in. (4,680mm) x 74.41in. (1,890mm) and a long wheelbase of 117.72 in. (2,990mm). With no transmission tunnel to accommodate, Jaguar designers used the free space to create an innovative 2.11-gal. (8-liter) storage area within the center console. With the traditional gear shifter also absent, the I-PACE Concept instead has smart storage space for phones, keys and other small items. Even with its raked rear glass the I-PACE Concept, features an 18.71 cu. ft. (530-liter) luggage compartment; the front luggage compartment under the hood offers an additional cubic foot (28-liters) of storage space. The I-PACE Concept introduces a new intuitive ‘flightdeck’ approach for the controls interface. The design philosophy emphasizes controls that fall ergonomically to hand and technology that promotes driver engagement. The floating center console found in the I-PACE Concept is a key element in advancing cockpit ergonomics, utility and performance. The console rises to connect with the dashboard and ensconce the driver, and provides a level of mechanical connection with the vehicle by positioning gearshift functions on its metal struts. Information is shared with the driver with elegant simplicity. Graphic elements of the human machine interface (HMI) have an editorial, monochromatic feel with a warmer, more human focus, mirroring current technology trends. Lighter font weights and the sparing use of color are designed to both improve readability, communication and reduce the driver’s information workload. Touchscreens, intuitive rotary dials and multi-function buttons offer the perfect balance of tactile analogue controls and interactive digital interfaces, helping the driver concentrate on the road, not their fingers. The primary interface is a 10-inch TFT screen blended seamlessly into the surface of the center console. A separate, 5.5-inch secondary touchscreen is paired with two laser etched aluminum rotaries that encase vibrant circular HD displays. This allows occupants to configure infotainment and climate while keeping full screen information on the 10-inch display above. 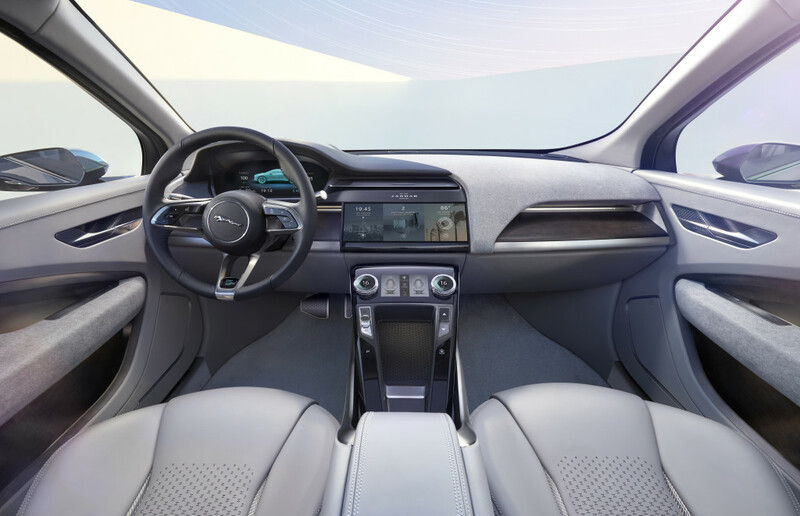 The I-PACE Concept also features a configurable 12-inch HD virtual instrument cluster and a full-color head-up display, providing the driver with the information they need when and where they need it. The I-PACE Concept introduces a new three-spoke steering wheel with multi-function capacitive switches. These remain invisible until illuminated, improving aesthetics and putting more functionality at the driver’s fingertips. To make them more tactile, they also feature a ‘micro-click’ haptic feedback when pressed. 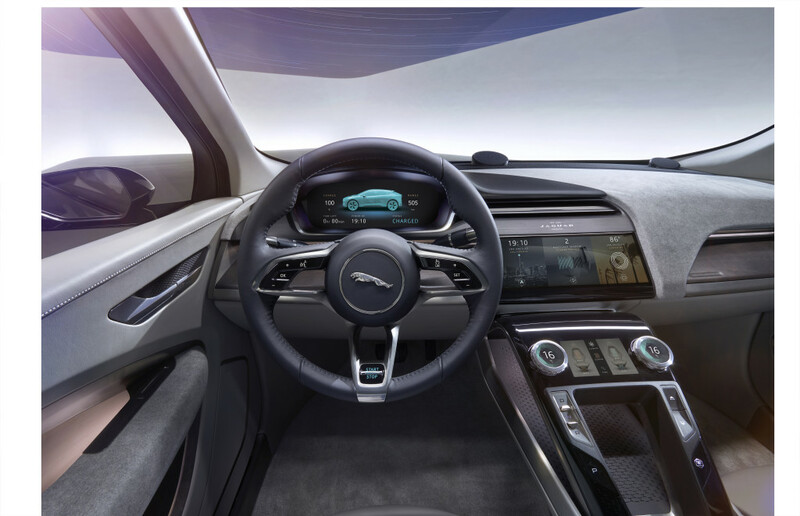 Like the InControl Touch Pro infotainment system offered in the current line-up of Jaguar vehicles, the system in the I-PACE Concept is designed in-house around a powerful quad-core processor, a high-speed solid-state drive and an ultra-fast Ethernet network. Combined, they deliver exceptional performance, responsiveness and functionality. 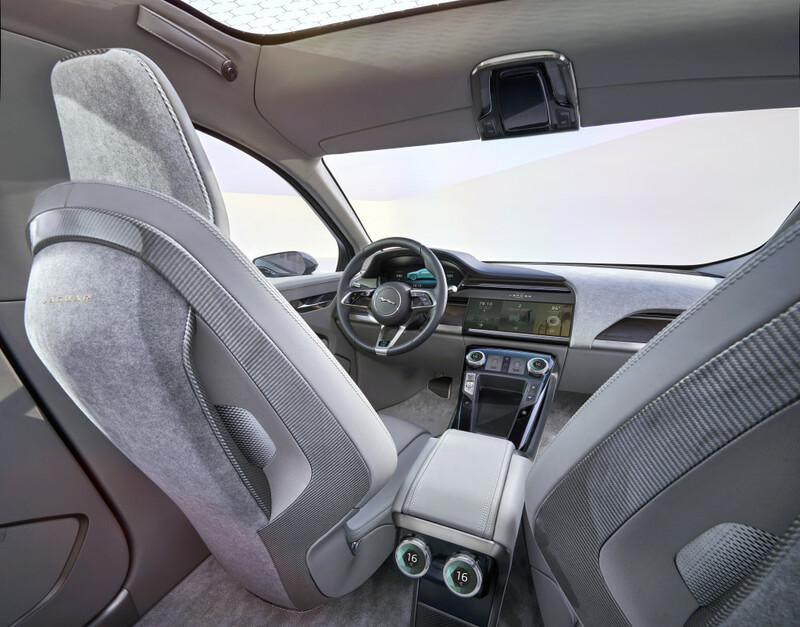 Just like the infotainment systems found in many Jaguar production cars, the I-PACE Concept features a Wi-Fi hotspot enabling occupants in every seat to stay connected and stream music, video and other data to their devices. The I-PACE Concept also enables occupants to use apps on their iOS® and Android™ smartphones through the vehicle’s main touchscreen using InControl Apps. The range of apps, optimized for in-vehicle use to reduce driver distraction, is growing all the time and now includes a unique Spotify app which is the first to offer recommended playlists on the Spotify home screen. Users can get personalized ‘Just for You’ playlists which contain recommended tracks, meaning less time is spent scrolling though menus searching for music. 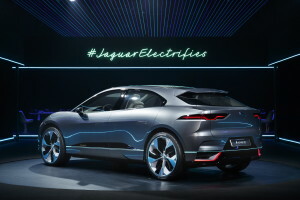 The I-PACE Concept delivers the driver-focused performance and response Jaguar is renowned for thanks to electric motors positioned on the front and rear axles; together these deliver 400hp and 516-lb ft of instant torque. Electric all-wheel drive helps the I-PACE Concept put power down and maintain traction on a variety of surfaces and weather conditions. Response is immediate and the system provides exceptional control over the front and rear torque distribution, responding immediately to driver inputs, road conditions and vehicle characteristics. “Electric motors provide immediate response with no lag, no gearshifts and no interruptions. Their superior torque delivery compared to internal combustion engines transforms the driving experience. The driving dynamics and responsiveness of the I-PACE Concept are further enhanced due to the battery’s ideal position beneath the floor and between the axles; lowering the center of gravity and reducing body roll. 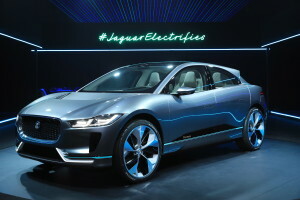 Jaguar Land Rover engineers designed and developed the synchronous, permanent magnet electric motors in-house to achieve the most compact design, greatest efficiency and maximum power density. They have an outer diameter of just 9.21in. (234mm) and are only 19.68in. (500mm) long. Rather than the conventional, offset configuration which places the transmission in front of the motor, the I-PACE concept features a more space-efficient concentric layout, which contributes directly to the excellent ground clearance and spacious interior. Electrification has a secondary benefit too; by selecting a higher level of regenerative braking, in stop-and-go traffic for instance, the driver can drive mostly using just the accelerator, with less need to apply the brakes to slow the car. To ensure drivers enjoy and exploit the performance of the I-PACE Concept in a variety of weathers and road conditions, the electric all-wheel drive system is enhanced with Jaguar traction technologies, including All Surface Progress Control (ASPC) and Adaptive Surface Response (AdSR). The Jaguar F-PACE has been widely recognized for its balance of ride, handling and refinement, and the I-PACE Concept will do the same. The sophisticated suspension design, the benefits of a low center of gravity and incorporating all of the lessons learnt developing the F-TYPE and F-PACE will set the I-PACE Concept apart from all other electric vehicles. The front suspension system relies on the same double-wishbone configuration proven in the F-TYPE and F-PACE because Jaguar believes there is no better system. “When you get behind the wheel, the driving experience reflects the dynamic design of the I-PACE Concept. It’s a Jaguar through and through and we will prove that a zero emission vehicle can be a true driver’s car. The high camber stiffness afforded by the lightweight aluminum double wishbone design is fundamental to agility and responsiveness – lateral forces at the tires’ contact patches build very quickly, and the steering responds immediately and precisely to the driver’s every input. And because of the superior roll camber gain characteristics inherent in the double wishbone system, the tires’ contact patches are better maintained throughout the suspension’s full range of movement, helping to optimize traction. Integral Link suspension design, proven in the Jaguar XE and XF sedans, and now the F-PACE, was the natural choice for the rear suspension in the I-PACE Concept. Its sophistication eclipses other multilink rear suspension designs to offer an exceptional balance of ride, handling and refinement. Integral Link enables chassis engineers to tune longitudinal and lateral stiffness independently. This means freedom to fully optimize comfort and dynamics attributes without the one compromising the other. As a result, the bushings which manage longitudinal forces can be made softer and therefore the ride is smoother and impact absorption quieter. The bushings which manage lateral forces can be made stiffer for more precise handling and even greater responsiveness. The Integral Link suspension is also extremely space-efficient. Combined with the compact rear electric motor, this contributes to the large luggage compartment volume and excellent ground clearance. For most customers, the I-PACE Concept will be the first electric car they have owned. Research and innovations by the engineering and design teams have simplified the ownership experience and lowered the barriers to adoption. The electric motors, battery pack and management systems give the best possible performance and a useful range for most daily journeys. The range of the I-PACE Concept is targeted to be around 220 miles on the US EPA cycle. The battery can be charged at the growing network of public charging stations, a dedicated wall box at home, or simply using conventional domestic power sockets. Charging is easy and quick. An 80 percent charge can be achieved in 90 minutes and 100 percent in just over two hours using 50kW DC fast charging. “Electric vehicles are inevitable – Jaguar will make them desirable. Zero emission cars are here to stay and the I-PACE Concept is at the cutting edge of the electric vehicle revolution. Energy storage in the I-PACE Concept is a liquid-cooled 90kWh lithium-ion battery pack, designed and developed in-house. The battery’s housing is lightweight aluminum and forms an integral part of the body structure of the I-PACE Concept. The battery uses pouch cells selected for their energy density, superior thermal performance due to lower internal resistance, and because of the design freedom they afford. Unlike some competing cell formats, pouch cells also offer excellent future development potential, especially in terms of energy density – this will enable greater range for a given size of battery, or will deliver similar range to today but from a smaller, lighter pack. The pack is liquid-cooled using a dedicated two-mode cooling circuit. In moderate ambient temperatures the battery improves efficiency by relying only on a radiator to remove the heat generated by the cells. At higher temperatures a chiller linked to the vehicle’s main air conditioning system provides greater cooling capacity to keep the battery in optimum condition. Energy efficiency is further enhanced by integrating a heat pump into the climate control system. The heat pump is far more efficient than conventional electric heaters because it uses energy from the outside air to heat the cabin rather than relying solely on drawing current from the battery; helping to extend the range of the battery even in freezing winter conditions. Jaguar has a proud heritage of motorsport success, winning the Le Mans 24 Hours sports car endurance race a remarkable seven times. Through competition, Jaguar has pioneered and evolved new technologies, from disc brakes to aerodynamic features. The Formula E Championship now offers a proving ground for electric racing and performance engineering. The series takes place on street circuits in the world’s biggest cities using standardized chassis and battery systems but allowing teams to compete with their own electric motors, control units and transmissions. The championship will accelerate the development of future electric powertrains. Jaguar engineers will ensure those advances feed directly into its road car programs. “It is my belief that over the next five years we will see more changes in the automotive world than in the last three decades. The future is about being more connected and more sustainable; electrification and lightweight technologies are becoming more important than ever as urbanization continues to increase. Range (EPA) Targeted in excess of 220mi.